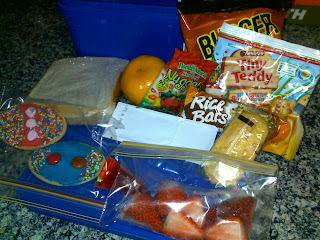 I only have 2 lunches to prepare; soon to be 3 next year, but both lunch boxes I prepare are different. This Is Master Z's typical daily lunch. · Want want rice crackers. · And some new fruit nugget thingy I found the other day thought it was worth a shot. Now hubby complains I "over pack" I honestly don't think I do, I know what he eats and am still learning what limits I can push to try and get him to try new foods. I pack his favourites so he isn't starving, but I add in new stuff in the hopes maybe his peers will intrigue him into trying something. A lot of it is hit and miss, we've sat down with catalogues and recipe books and gone through what he might like to try (his father is a fully qualified chef nothing is impossible) but I get the same vague shrugged response. I’ve baked muffins, Quiches in tiny pastry cups, made salad wraps, savory biscuits, jelly, custard, yogurt, brought every lunch box snack in stock at Woollies, Coles and Aldi, and still only have a list of 5-6 things he’ll eat on a regular basis. My other two don't care, if its edible, consider it gone, but this one lunch box does my head in every morning, eats at me all day, until 3pm when I can assess the damage and hope that I’ve discovered a new food item he’s eaten, enjoyed and actually likes. Do You Have A Dreaded Lunch Box? ?